HISTORIANS remind us that we can't have a better tomorrow if we are thinking about yesterday all the time. We are advised that having a vision does not ensure greatness, but the lack of vision surely prevents it. The challenge in crafting a vision for a better tomorrow can sometimes be disruptive, which leads some people to ask whether we need to disrupt the healthcare system to save it. The same question is being asked about National Health Insurance (NHI), and the extent to which its socioeconomic and political trappings are disruptive. The arrival of NHI can be linked to the concept of disruptive innovation, defined by author Scott Anthony as "something that creates a new market or transforms an existing one through simplicity, convenience, accessibility, or affordability". Expressed differently, disruption in business is a process of transformation that leads to an industry operating in a completely different manner than it did before. Innovators bring new insight to problems. They challenge assumptions, and they create environments that help to change traditional attitudes. Because they are reluctant to accept the status quo, innovators turn problems into challenges. 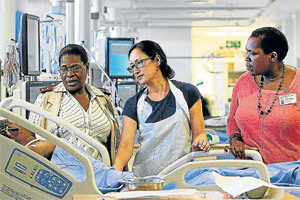 Transformation of the healthcare system through innovative changes that are thoroughly researched and correctly implemented researched and implemented can improve patient-centred healthcare at a cost that is affordable by the people it serves, says the writer. In an industry such as healthcare that is experiencing uncertainty, innovation should thrive. Innovation is required of us. In the healthcare sector, innovators walk hospital hallways and listen to physicians, staff, and others who deal with patients and other consumers of their services. Innovators take advantage of opportunities. They quickly make decisions and possess strong, but prudent tolerance for risk. We need disruptive innovation to save the country's healthcare system, with affordability and quality outcomes ranking at the top of the disruptive agenda to deliver outcomes at an affordable cost to the people being served. We are not the only country with an innovative disruptive agenda. Healthcare management systems around the world are struggling. The rapidly rising costs associated with the provision of quality health services to citizens is a major challenge, as is the implementation of measures to ensure that cost escalations are kept to a minimum. THIS dilemma is being researched and tackled in most countries in which medical inflation is outpacing general inflation by several percentage points. In SA, this reality must be considered together with the socioeconomic landscape of the country. The social determinates of health including access to clean water, housing, education, and meaningful employment are exacerbated by a struggling and strained public healthcare system. Viewed in its entirety, the healthcare picture appears bleak. Different health systems have different challenges and a major concern of administrators and policy makers is the question of how the provision of quality healthcare can remain sustainable. The healthcare system needs salvation and disruption, or disruptive innovation will undoubtedly play a role in this. The NHI white paper articulates a clear focus on improved primary healthcare, that includes the promotion of health and disease prevention. This, in turn, embraces myriad opportunities within the sector, that could both be disruptive and sustaining innovations. Sustaining innovations are those that improve existing processes and quite simply, make the entire industry function better. There are many instances of such innovations, and they emanate from different spheres. An excellent example is the potential effect that health apps synchronised to electronic health records can have, and the predictive values of "big data" that will result from this. A PwC report released earlier in 2016 highlighted developments such as bedless hospitals and virtual care centres, that have the potential fundamentally to change aspects of care delivery in the health system. For the disruption of the healthcare industry to be effective, however, it should not occur in isolation. It requires that small disruptions occur in different parts of the broader system. Areas of focus identified by Clayton Christensen, a Harvard professor who coined the term disruptive innovation in his book, The Innovator's Dilemma, include provider reimbursement; role and integration of the pharmaceutical industry; hospitals' business models; clinicians' practice models; chronic disease management; role and integration of medical technology companies; the political and civil will to drive change; and the manner in which healthcare providers are trained. In SA, transformation has already begun in many of these areas, but it is still early days. AS WE watch the slow implementation of NHI, remember that no single disruption will eliminate all that ails the health system because there are just too many moving parts. There are also elements that do not need to be changed, but must rather be supported or developed. So, does our healthcare system need to be disrupted in order to save it? Yes. There are structural faultlines running through it, and these need to be attended to through the reinvention of its key elements. Innovative changes that are thoroughly researched and correctly implemented can bring about the progressive improvement of patient-centred healthcare with quality outcomes at a cost that the system can afford. NHI is geared towards problem solving in the healthcare sector. With NHI, the government is demonstrating that it is focused on the future, biased towards action, and that problems can be solved consequently, tomorrow begins to look better than yesterday. The disruptive innovation of NHI is about doing old things in new ways and doing new things creatively. Innovation through NHI is the recreation and the introduction of ideas that will lead our country towards the vision for which we are all striving an affordable and accessible healthcare system. Chinyanga is an executive manager at AfroCentric Health's subsidiary Medscheme.